Love this set. Looks great on the patio and very useful. The Angeles outdoor bistro set will fit your entertaining needs, the ice bucket will keep your drinks cool while you dine and it conveniently fits in the center of the table. This stunning set boasts atimeless design with an old-fashioned copper finish and ornate metal scroll work. Enjoy a cup of coffee in the afternoon, or share a bottleof wine with a loved one at the end of a romantic evening at this intimate table set. 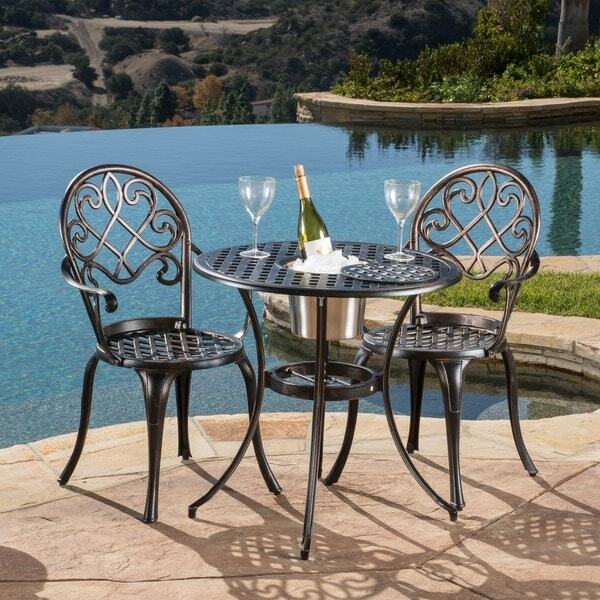 This set is constructed from cast aluminum to provide lasting durability, perfect for outdoor use. 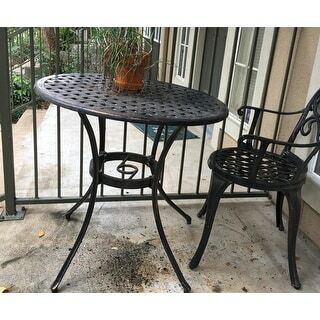 I bought this set for a balcony in a condo. It is the perfect size. The quality is really quite nice and the ice bucket is a real bonus; which you do not even know is there except in use. The design is very pretty and for the money this is an excellent value. The 18inch pillows (purchased separately) are too large and I am returning. The seats are actually comfortable without cushions so I will probably not order more. Also, the chairs are so pretty I think the cushions take away from the set. I would recommed this set. First, the good: This table has serviced my small child and me well for about two years on the front porch. After some initial snafus with missing parts, I was thrilled to have everything assembled, and the assembly itself was simple. The bronzing effect is very stylish, and the ice bucket in the middle of the table is perfect for enjoying a long sit outside in the south Texas heat. The tabletop size is generous, even while using the ice bucket, so no worries about having room for a fairly complete table setting. I was initially worried about using harsh cleaners on the table, because I didn't want to ruin the finish, but I ended up using Clorox wipes on it because the squirrels and other wildlife run across and perch atop it, and the finish has worn just fine over the past two years. Now, the not-so good: I noticed recently that my table was leaning, so I took a good look at it and discovered that two of the legs underneath were bent. And then I noticed the crack that had occurred, so I think the metal quality must not be terribly sturdy. The positive side of the reduced metal quality is that the whole table assembled is very light and easy to move. The reason the table legs bent is because the postal service workers had been placing my packages atop the table. Ultimately, I believe a heavy box of ammunition is what did it in. Lucky for me, I actually ended up purchasing two of these, so I could have the extra chairs. So I will break out my backup, and put a warning note for the postal service workers not to leave packages on the new table. FYI: My postal worker friend informs me that by signing up at the USPS website, one can leave instructional notes for delivery for one's local post office. I don't know if UPS and FedEx have similar functionalities on their websites, but probably a note on the table is a good idea regardless. In sum, I would definitely purchase this table, again. But I would also be a bit more circumspect in its usages as regards its strength and sturdiness. I love this outdoor bistro set. Really cute. Perfect for the little empty corner near the gate. Makes a great place to chill an extra bottle or set a plate of appetizers when we're hosting. But I can also put it in the garden when I want to sit and read quietly. I really I only wish I could get an extra chair or two without having to buy another set; just so I could have options. It has held up well over nearly two years and the finish looks like new with a quick dusting, or a little splash of water. And the design on the backs of the chairs work really well for me. They are different from the other aluminum furniture I have poolside, but the backs are not so detailed or busy that they call attention to them. BTW, I bought the 18 inch round seat cushions to use with the chairs and they are too big. As I was expecting guests just after I got them, I used them and they're okay. But I would probably be better off with the 16" cushions. I am very pleased with this purchase. It is very attractive, blends well with my dark brown wicker furniture, and 15 inch pillows (purchased elsewhere) fit well on the chairs. When I opened the box and saw all the parts I thought, "oh no," and closed it. I waited a couple of days to assemble it because it looked complicated (and the directions said two people were needed) and I had to be in "the mood". I was pleasantly surprised when I was. The quality is great and it was really easy to put together! I did it (age 60+) without any difficulties. All the holes lined up which is a HUGE plus, the instructions were cllear, and including extra hardware was so smart. The legs can be adjusted to make sure the pieces are level too. The manufacturer seemed to actually put some "thought" into making the product better. I would recommend this bistro set and I now defintely look at other Christopher Knight products when I'm shopping. There are a lot of bistro sets being sold. The things I like most about this particular set is: (i) it is made of cast aluminum so it won't rust, (ii) the chairs have arm rests which is somewhat unusual, and (iii) I really like the ice bucket that is integrated into the table which is a unique design feature. The set was fairly easy to assemble although I strongly suggest using your own tools to do the assembly rather than the "tools" included with the set; using your own tools will make the job a lot easier. I have only had the set assembled for about a month, so I have no idea about its long term durability, but I see no reason why it should not last many years. Bought this table for a mini-courtyard area on cobblestone and it adjusts great to the uneven surface. It seems sturdy and the seats are fairly comfortable. It is just the right size for a small area. 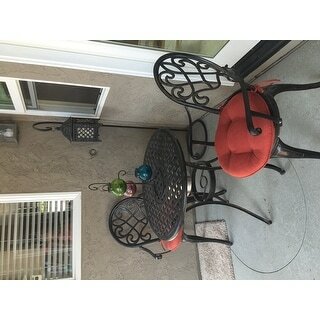 My husband and I sit outside in during warm afternoons and evenings sipping wine, and this table is perfect with the built in bucket in the center for keeping the bottle cold. The bucket is removable and there is a center piece that fits into the bucket hole so you can store the ice bucket in the house until you need it. I highly recommend it! It looks very French! This is the cutest little table and chair set. I can't wait to entertain this summer. The ice bucket in the center of the table is the best. We love the Bistro set. The wine bucket feature in the table top is a very smart and useful addtiion to the set. Very high quality, easy to assemble, comfortable, solid, and "smart" looking. We are extremely happy with the choice. Nice bistro set with ice bucket. Perfect for extra outdoor seating that doesn't take up a lot of space. This set was a great addition to our deck entertaining space. I bought this product based on the comments from other buyers. I actually bought two. I thought they would be perfect for the courtyard of a building I own. They both arrived in good condition, with the exception that one was lacking most of the screws/nuts. So, I had to go an buy some at the hardware store. However, the biggest surprise was the warning to not place these outside where they'd have exposure to the sun or rain. What gives? 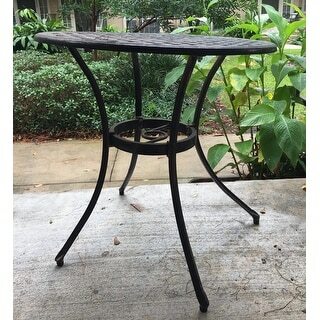 They are labeled as "outdoor" furniture. Well, they're outside now so I have no idea whether they will hold up or not. They look nice but I doubt I'll buy something from Christopher Knight brand again. I was very happy with this purchase again from Overstock.com. Package delivered in one big box, but no damage at all. I spent more than an hour to assemble by myself (female over 50). Lots of parts and instruction was helpful. Extra nuts and screws were great idea from manufacture. It is very easy to lost those small parts if you are assembly outside. It is very pretty and rich looking. I get many compliments on it. Not the most comfortable seats but, I bought it mainly for appearance and it is impressive looking. I keep the bucket out most of the time. I like the idea of having it if I want to use it for a chilled bottle of wine. 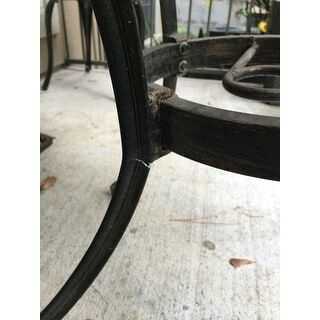 This is a sturdy bistro set that still looks new ~2 years later. We moved across the country and it was easy to take apart and put back together. Bought this a couple years ago and it still looks fantastic! I do have it under a roofed patio area though but I put a little pledge a few times a year to keep it looking good! Beautiful set. Very comfortable chairs ... no cushions needed. Just the right size and great weight of set. This is so we'll made. I ordered one 4years ago. It's been on our deck in Florida. It still looks like new. I liked it so much I ordered two more. I've recommended Christopher Knight products to all my friends. I bought 3 sets! They are really nice, a little lighter in weight but they work for me! This is a solid, sturdy, quality set! The instructions for assembly aren’t super clear, but the process to assemble isn’t terribly complex so I understand why they didn’t bother detailing. I love how they tie the instructions & pieces with colored ribbon so they’re easy to find. There was a short wrestling match to line up screws when assembling a chair but I got it there! The chairs and table all have self-leveling bottoms. Not only an awesome feature but surprising to see at this price point. Love the ice bucket and that the table is beautiful whetherchilling champagne or nibbling on lunch. Very comfortable and an excellent quality for the price. Looks great on my patio. I bought cushions for the chairs that I change seasonally. Great purchase! Awesome bistro set. It is very sturdy and well made. We purchased this set for a small breakfast nook. My husband and I decided to play a board game on it after we put it together. We were happy to find out that it is very comfortable. Surprised since the seat is metal, but didn't feel like it after using it for an extended time. I love this set as it's very durable and light weight. Perfect to sit on my patio. "I already purchased this table but I would like to buy two more chairs to match. Please let me know how I can do this?" "Does this set have an umbrella hole option instead of an ice bucket?" You may enjoy item# 19491764.
it doesn't have an umbrella hole on the top of the table but mid-way down to the floor, there is a hole. You can try to drilling a hole on the ice bucket cover to create your umbrella hole or fabricate one from plywood or another metal piece. "I purchased this set a couple years ago. Has stood up well to the elements, we had a storm last night and the winds picked it up and tossed it into the grass imbedding one of the legs into the ground which bent it. Can you put me in touch with the manufacturer to see if it is possible to purchase a replacement leg? Thanks"
"How tall is the table "
Table dimensions: 27 inches high x 27.5 inches wide x 27.5 inches deep. "What is the weight capacity for the chairs?" I weigh 230 lbs and use sit in the chairs every morning drinking coffee. "What size bistro cushions do I purchase - 16"??" The seat is 15 x 15. "Wish to order table with ice bucket but prefer chairs without arms. Is it possible to substitute chairs?" I don't see why not the table is plenty big enough. I don't know if they sell the table individually, but if they do, the pattern is versatile.